This is a convenient new review e-book, consisting of nearly 1000 case-based problems. Whether you're studying for the board, recertifying, or just looking for a convenient way to make sure your patient-care skills stay sharp, this internal medicine self assessment tool makes review easy and enjoyable. * Comprehensive. 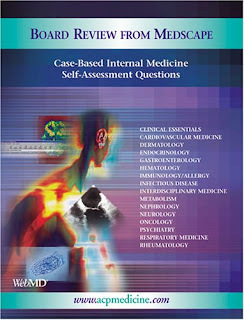 An extensive library of questions covers all of adult internal medicine, plus Psychiatry, Neurology, Dermatology, and more. And, each of the 981 questions presents commonly encountered cases, diagnostic and therapeutic options, and in-depth reasoning and explanations on the recommended choices. Covers all the major areas of practice you need to review to score well on the exam. * Trustworthy. Questions are derived from the respected ACP Medicine CME program. For further reading, the problems are referenced to ACP Medicine, a continually updated, evidence-based reference of adult internal medicine. The cases are reviewed by experts in clinical practice from our editorial board at the nation's leading medical institutions. * Relevant. Case-based for greater relevance to daily practice—the format selected for many of the questions on recent exams. These self-assessment questions provide easy-to-understand, detailed explanations of the principles behind the answers—an ideal way to get ready for the boards or recertification. * Print or Electronic Formats. Our problem series can be ordered in traditional print or convenient e-book formats. The soft-cover print book is approximately 600 pages, published in July of 2005. Or, our e-book offers a convenient PDF format for immediate download and allows you to test your medical knowledge wherever you choose—from your computer or handheld device or by printing out an easy-to-read hardcopy to carry with you.